Nigeria suicide bombings: Teenage girls and Boko Haram. 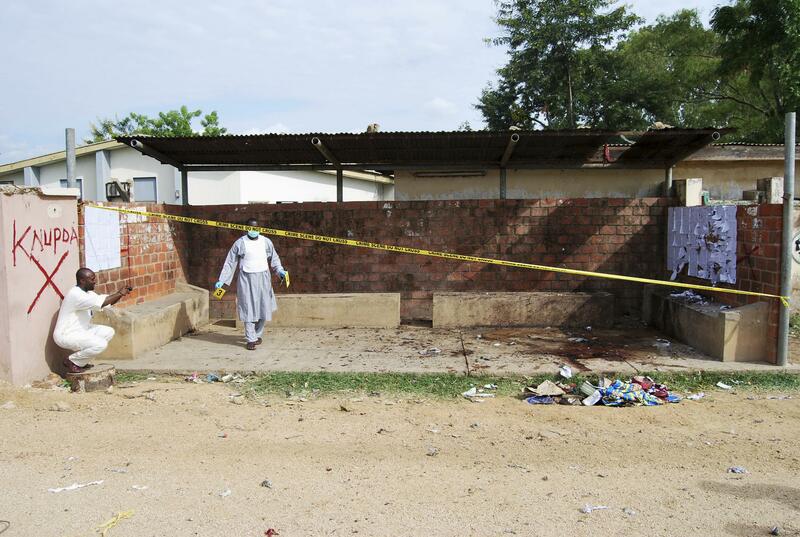 The site of a July suicide bombing, perpetrated by a woman, in northern Nigeria. Two female teenage sucide bombers have killed more than 20 people at a bazaar in the northeastern Nigerian city of Maiduguri, the birthplace of Boko Haram, officials say. An official with Nigeria’s Civilian Joint Task Force told the Guardian one of the girls detonated her bomb first, killing about three women; then, when a crowd gathered, the second girl detonated hers, killing more. Officials from the National Emergency Management Agency said 21 bodies had been removed from the marketplace thus far, according to Reuters. While internationally Boko Haram is known for kidnapping hundreds of schoolgirls, women have also been instrumental actors in many of the group’s attacks. The prominence of female fighters in extremist groups like Boko Haram might seem surprising given such groups’ general attitude towards women, but that’s part of the element of surprise that makes women so effective as bombers. (The explosive device can also be disguised as a baby bump.) In a single week last summer, four suicide bombings were carried out by Boko Haram–affiliated women in Kano, Nigeria. Explosive vests have been found on Nigerian girls as young as 10 years old. Elsewhere, attacks by women have been carried out everywhere from Moscow to Mosul. The strategy can be traced back to Lebanon in the mid 1980s, where it was pioneered by the Syrian Socialist Nationalist Party. While leftist and secular organizations were initially the only ones to employ women as bombers, the Washington Post wrote earlier this year, that’s changed as Islamist radicals have evolved to identify a female obligation to participate in jihad—and in fact, female attackers have become so accepted among religious extremist groups that even some male members of Somalia’s Al-Shabaab sometimes now disguise themselves as women before setting off bombs.